Who is Rack & Riddle? Wine industry executives Bruce Lundquist and Rebecca Faust joined forces with a dedicated team of production professionals to found Rack & Riddle--the ultimate Sonoma County custom crush and wine service company in two ideal locations in Healdsburg and Alexander Valley. At Rack & Riddle, you're more than a client, you're our partner. From small boutique wineries to large multi-national wine producers and everyone in between, we provide unparalleled custom crush and winemaking services to all of our partners. We work with you to ensure you receive exactly what you want and need from grape to glass or to simply assist you with your existing winemaking and production needs. With a blend of traditional methods along with the best of new technology, Rack & Riddle is dedicated to sustainable farming practices, allowing nature to bring out the unique attributes of every winegrape that passes through our facility. Rack & Riddle is California certified organic for those wishing to produce organic wines. Ship your wine or grapes to us, and we'll work within your protocol to create an outstanding finished product! We are about more than just slapping a label on a bottle or mass producing wines. We are about ensuring the true nature of the wines shines through so distinctively that you'll be proud to share, sell, and taste for yourself the wines crafted with our care, passion and expertise. In short, we'll help you create wine that's ready to stand neck and neck with the area's best. Call (707) 433-8400, or email us. Make Sparkling Wine or Still Wine at Rack & Riddle! If you don't see a service you want, contact us, chances are we'll be able to accommodate your needs. Contact Rack & Riddle today at 707.433-8400 to learn more about the Sparkling Wine Private Label Program at Rack & Riddle Custom Wine Services! Learn how Rack & Riddle\'s private label sparkling wines and custom crush wines are made in the traditional method! Rack & Riddle Custom Wine Services, one of the largest custom crush and winemaking companies in the North Bay area, today announced its new Healdsburg facility is fully operational. The 67,000-square-foot facility focuses on complete sparkling winemaking production, white wine fermentation and still wine bottling. A grand opening and ribbon cutting ceremony will take place August 27th from 2 p.m. to 6 p.m. for the new wine production facility. 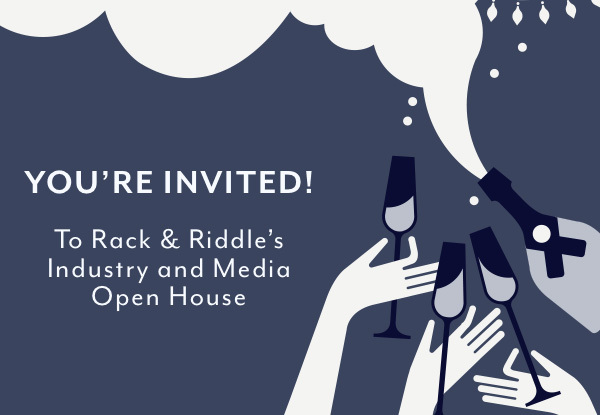 You're Invited to Rack & Riddle's Industry and Media Open House! Tours include previewing our newly expanded facilities and unveiling of new equipment designed by MASPACK Packaging USA! Help us name our new Tirage Robots and win a prize! In order to safely tour our facilities, proper footwear is required. Healdsburg, Calif (March 25, 2019) – Rack & Riddle, Sonoma County’s leading custom crush wine service, has recently expanded its winemaking team in preparation for a busy 2019. With a newly automated still wine bottling line and an automated sparkling wine facilities expansion set to be completed in Spring 2019 (more TBA next month), Rack & Riddle is expecting an exciting year in custom crush wine production. The winemaking team has been expanded by three employees in recent months. The team, led by award-winning Executive Winemaking Director Penelope Gadd-Coster and Head Winemaker Manveer Sandhu, is prepping for the uptick in custom-blended private-label sparkling wines sales, as well as significant demand for full production still and sparkling wine services. They’ve been training staff in advance of the expansion to accommodate their growing customer base. Penny has been with Rack & Riddle since 2007. Her talents have garnered more than 100 medals and awards in the past few years; more than 30 Best of Class, Double Gold and Gold medals in the past few years alone for Rack & Riddle and client wines. Penny was named “Winemaker of the Year” in December 2013, honoring her significant contributions to winemaking. An incredible achievement, as contenders included the top winemakers from Sonoma, Napa and the greater Bay Area. An accomplished writer and speaker, she was also selected as an expert panelist at the WIN Expo in Sonoma County, the 2015 Women in Wine event in Napa, and most recently at the 2018 Women in Conversation for Sonoma State University. “Working for Rack & Riddle has given me the opportunity to be an integral part of a company that has been built from the ground up, just like my career,” says Gadd-Coster. Manveer has been with Rack & Riddle since 2011. Under the direct tutelage of Penny Gadd-Coster he has mastered the art of Méthode Champenoise, advancing from Production Winemaker to Head Winemaker. He manages day-to-day winemaking operations for sparkling wine production as well as overseeing the winemaking team. Under the direction of Penny, he mentors the team to not only advance the art of winemaking, but to pass on the Méthode Champenoise tradition. A graduate of UC Davis with a bachelor’s degree in neurobiology, he studied for two years under noted viticulturist Dr. David Smart. Jenn Zeek joined us in 2014, bringing a decade of previous winemaking experience with her. While working for harvest and cellar at several wineries, Jenn pursued a B.S. in Viticulture and Enology at UC Davis, graduating in 2008. Following graduation, she took jobs working harvest at Balletto Vineyards before moving to lush New Zealand for the 2009 harvest at Mud House Wines, before working at Sonoma Wine Company as a lab tech, where she was promoted to lab manager. 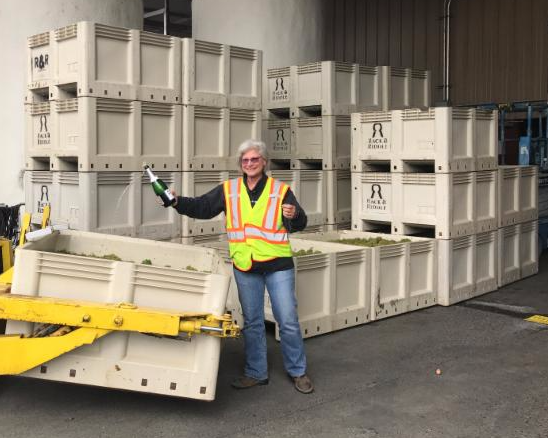 She then worked as winemaker for Murphy Family Custom Crush until 2014 when Rack & Riddle took over the facilities and offered her a position to continue on with custom crush. Sarah is the Assistant Operations Winemaker. She assists in all areas of grape-to-bottle still and sparkling wine production. Year-round, she is the evening winemaker, and also assists during harvest at the production facility in Alexander Valley during crush. She’s a seasoned Sommelier not afraid to get her hands dirty and transform fruit into a wonderful product that will delight. Erin is an Apprentice Winemaker at Rack & Riddle. She’s one of the latest recruits, having joined us in August 2018 after graduating UC Davis with a Master of Science degree in Viticulture and Enology. She also holds a B.S. in Chemistry from University of North Carolina, Asheville. As Apprentice Winemaker, she is learning all aspects of both still and sparkling winemaking, including the age-old Méthode Champenoise practice that Rack & Riddle is known for. 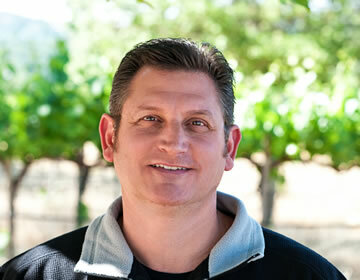 California native Adam Toomire, is an Apprentice Winemaker. In this hands-on learning role, he encounters all aspects of winemaking: Lab work, cellar work, production management and client relations. Born and raised in Morgan Hill (South Bay), he attended Chico State University, graduating in May 2017 with a degree in Ag Business. He’s been working full-time in wine cellars for the past four years at small, family owned wineries. These small production wineries have helped him grow his skills and passion for the business. Jordan joined the Rack & Riddle team in April 2018, starting as a lab tech, and quickly advancing to Apprentice Winemaker. As an apprentice winemaker he is learning the art of winemaking and all that entails — from learning the artisan Méthode Champenoise sparkling wine practice — to advanced still winemaking. 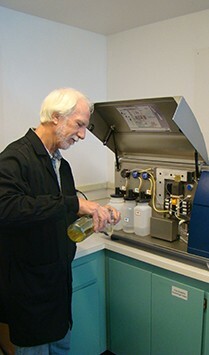 He works in both our wine cellars and state-of-the-art wine lab doing analysis, and whatever is needed. Originally from Troy, Vermont, Jordan grew up on a dairy farm. You could say that the ag-business is built into his DNA. In 2013, he graduated from California State University, Fresno with a Bachelor’s of Science, Enology degree. Prior to university, he served five years in the U.S. Navy as a Machinist’s Mate with deployments to both Iraq (twice) and Afghanistan (once). With three locations in Sonoma County, California, Rack & Riddle is an innovative leader in the custom crush, custom wine services marketplace. Committed to providing pristine facilities where both internal and client winemakers are able to craft award-winning still and sparkling wines, the facilities are bustling year-round. The 2018 installation of a state-of-the-art, high-capacity still wine bottling line provides clients with the ability to rapidly produce their wines and keep up with demand. 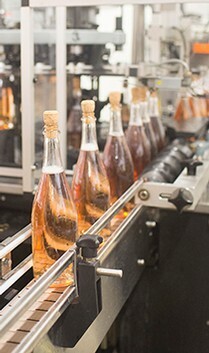 Installation of an automated, high-capacity sparkling wine bottling line will be completed Spring 2019 — just in time for the summer and fall disgorging seasons. Rack & Riddle offers complete grape-to-bottle and base-to-bottle production for still and sparkling wines, and private-label sparkling wine services. The facilities house nearly two million gallons of stainless steel storage and fermentation vessels. An exceptional winemaking team produces 1.7 million cases of wine annually. To learn more, visit Rack & Riddle online at rackandriddle.com, and follow on Facebookand Twitter. For interviews with the winemaking team, please contact Cynthia Faust, at cynthia@rackandriddle.com or call (707) 433-8400 x201. For information about facilities and operations, journalists are asked to contact Mark Garaventa, General Manager, mark@rackandriddle.com, (707) 433-8400 x125. In the meantime, they will be on hand to discuss the upgrades and answer questions at the UNIFIED Wine and Grape Symposium January 29-31 in Sacramento at BOOTH #1837. MASPACK Representatives will also be available for meetings or introductions during UNIFIED. Please email Alberto@maspackusa.com or Dan@maspackusa.com if you would like to set up a meeting to answer all your questions. Discover premium customized sparkling wines that you can label and sell at an attractive price-point to ignite profits. 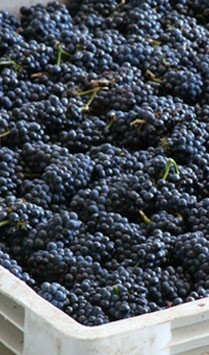 Our services include: Private-label, base-to-bottle, and custom crush grape-to-bottle. Ask us about our full production still wine services — custom crush grape-to-bottle and base-to-bottle automated bottling services. We're excited to speak with you at the show! as you gear up for the busiest time of the year. Add a new SKU or refresh your current offerings by introducing a Sparkling Wine to your Tasting Room & Wine Club offerings. We are now booking disgorging dates in October so time is running out! Don't miss out on those OND sales by waiting too long! can help you start or grow your program! for samples, pricing, or to schedule a facility tour! 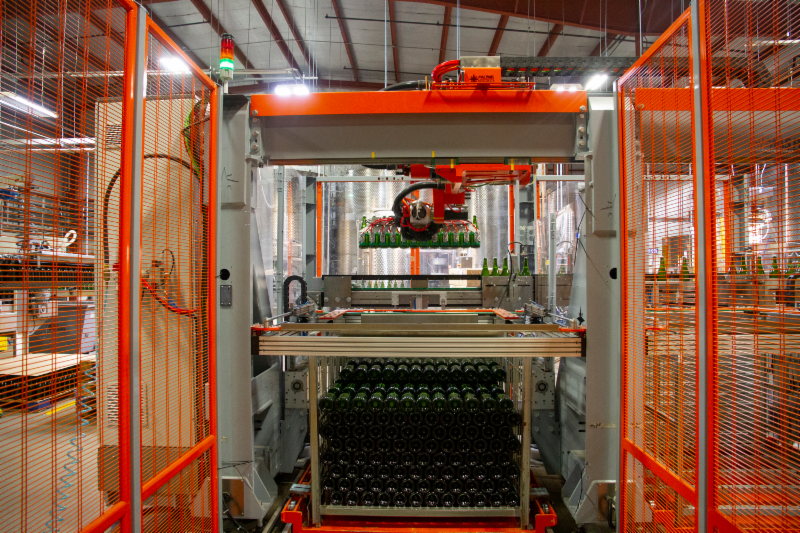 Healdsburg, Calif (June 13, 2018) – Rack & Riddle, Wine Country’s leading custom crush wine service, has recently upgraded its facilities with a fully automated, state-of-the-art still wine bottling production line. The advanced robotic system now provides increased output and accuracy for its custom crush clientele. Installed in late 2017, the bottling line designed by Mas Pack Packaging USA, is fully operational. All testing phases are complete, staff is trained, and the company has positioned itself for a high-yield 2018 crush season. With the new system in place, production line staff was decreased from 13 techs per shift to 5, yet no jobs were lost in the process. Employees were cross-trained and reemployed in other positions within the company. “We’re excited to provide a fully-automated bottling line, helping us to maintain Rack & Riddle’s position as an industry leader in the Custom Crush market. Leading-edge production technologies and outstanding quality control allow for maximum output and the highest of efficiencies for our valued clients,” says Mark Garaventa, General Manager at Rack & Riddle. The automated production system is fully customizable for each bottle run, handling 375ml, 500ml, and 750ml formats. It can process 150-bottles per minute and up to 6,000 cases in an 8-hour work shift – increasing efficiencies – without sacrificing the premium quality Rack & Riddle is known for. The bottling line is staffed with a team of five skilled operators per shift, and each line has a dedicated quality control tech to ensure that the highest of standards are met. All wine chemistries and packaging are strictly monitored throughout each bottling run. Bottles are filled and scanned through a sophisticated Vision System which performs inspections of bottle fill height. The system then checks that filled bottles exiting this portion of production have corks or screw caps properly positioned. Any bottles not meeting requirements for fill height or missing proper closures are rejected, accumulated and audited by quality control personnel. Once filled, foiled and labeled, four precision cameras capture 360-degree views of each bottle, inspecting for correct label information, placement, defects (such as wrinkles or air bubbles), doubled labels and flagged corners. The system can automatically separate bottles from cases, sending cases to an overhead conveyor and bottles into a filler. The Automatic Case Packer packs two 12-pack cases of wine at a time, seals the cases, weighs them, and rejects any that are underweight (missing bottles). Cases are tagged with ID labels then automatically palletized, based on a specific pallet configuration set by the operator for each run. Pallets are then wrapped for transport by an automatic wrapping mechanism, where a printed pallet ID tag is applied. “Working with Rack & Riddle to install the newly automated bottling line was a rewarding experience for everyone. The Rack & Riddle team modified quickly to the new system, and the tech team and bottling line are running at maximum output,” says Alberto Migliardi, CEO of Mas Pack Packaging USA. With its expansion in 2014 to two new locations in Sonoma County, and the installation of a high-output automated production line, Rack & Riddle is proudly committed to providing pristine facilities where winemakers craft both still and sparkling wines. Rack & Riddle offers complete grape-to-bottle, base-to-bottle, and private label wine programs, and houses nearly two million gallons of stainless steel storage and fermentation vessels. An exceptional winemaking team produces 1.7 million cases of wine annually. To learn more, visit Rack & Riddle online at rackandriddle.com, and follow on Facebook and Twitter. Book your space for CRUSH 2018 at Rack & Riddle! Reserve your space now for Harvest 2018 at Rack & Riddle Custom Wine Services. We offer full service grape to bottle custom crush for still & sparkling wine, plus everything in between! If you are a prospective client, contact our Business Development team to discuss your project and hear more about our services. Book a tour of our facilities and meet with us in person to discuss your individual needs & protocols. HEALDSBURG, Calif., January 18, 2018 – Rack & Riddle Custom Wine Services, one of the nation’s largest winemaking operations specializing in sparkling wine and still wines, has brought on board a winemaking consultant in response to its fast-paced growth and recent facilities expansion. Rack & Riddle has partnered with Jerome Barret, a consultant with over 20 years’ experience in methode Champenoise, the French style of sparkling winemaking Rack & Riddle is known for in the industry and with consumers. Barret will work alongside Rack & Riddle’s Director of Winemaking Penelope Gadd-Coster, who leads an in-house team of winemaking and operations staff members. Barret, who hails from France and speaks three languages, “brings a world-wide perspective in the sparkling wine business with his expertise in global wines,” said Rack & Riddle Gadd-Coster. Barret’s experience ranges from cellar master to winemaker, and expert lecturer with the Institut Oenologique de Champagne, and has handled wine exports on four continents as well as large equipment investment budgets and line production design. He holds winemaking degrees from Reims University and Lycee Viticole d’Avize. Founded in 2007, Rack & Riddle is a family-owned operation that has seen steady growth, expanding to two new locations in 2014 and more than doubling its case production in the past decade. Rack & Riddle offers services–from “grape to glass” or a la carte–to both large and small producers nationwide. Clients can make wines from grapes or base wine, or choose from a selection of private label sparkling wines. LAST CALL to receive your Sparkling Wine in time for the Holidays! December dates are going, going, almost gone! Boost your Holiday Sales with a Private Label Sparkling Wine program. Total shipments of sparkling wine and champagne to the U.S. reached 25.6 million cases in 2016. Up 14% from the previous year, the category is showing very strong growth. Sparkling wines/champagne accounted for a 6% share of the U.S. wine market. Add a new SKU or refresh your current offerings by introducing a Sparkling Wine to your Tasting Room & Wine Club offerings. Our lineup of stellar wines won't last long and our disgorging schedule is booking up quickly. Don't miss out on those Holiday and New Year sales by waiting too long! Request your samples today via email monica@rackandriddle.com or call 707-433-8400. As the leading producer of méthode Champenoise Sparkling Private Label Wine in California, Rack & Riddle Custom Wine Services can help you start or grow your program! We hope you, your families, and your employees are safe following the devastating firestorm that ripped through the North Bay over the last 36 hours. All of us have been affected in some manner by these fires that swept through areas of Napa County, Sonoma County, Mendocino County and Santa Rosa. We have employees, friends, and family who have lost their homes and with that, nearly everything they owned. It is a heartbreaking and tragic circumstance. While humbled and extremely saddened by this event, we refuse to be broken - not in spirit, nor in our compassioned approach to the days ahead. Together we will find the answers to the many challenges that will be forthcoming. With this in mind, if you have any service needs regarding your businesses that we can help with - please let us know. We have been taking calls for fruit pressing, and expect other such requests will follow. To the best of our abilities and space permitting - we will do all we can to assist you. Please let us know how we can help. Call our main number - 707-433-8400 for assistance and requests. You can ask for either Rebecca or Bruce. If there are other needs or assistance that you feel we can help with, please contact us - even if it just a place to have a quiet room and some time alone. Again, we are here to help you if needed. wine sales have increased more than 12 percent despite being only 6 percent of the entire market. Do you want to learn how you can add Sparkling Wine to your portfolio? Booth #1839 at the 2016 Unified Wine Symposium in Sacramento. Click here to add Rack & Riddle to your show planner scheduling tool and send a quick email to make an appointment! CLICK HERE To add Rack & Riddle to your schedule at Unified! Or call us now and book an appointment to meet one-on-one with our knowledgeable staff during the symposium! Discover how Rack & Riddle's collaborative, customer-centered approach can help you achieve your winemaking goals in 2016. To celebrate the Chicago Cubs’ historic first World Series championship since 1908, Wine by Design, the exclusive wine licensee of Major League Baseball, is delivering a limited-edition World Series Championship Brut with Rack & Riddle. Rack & Riddle, one of the largest custom wine operations nationwide specializing in sparkling wine, has created the Cubs World Series sparkling wine. Wine is available online and at select retail outlets. For more information, visit mlb.com/wine. The San Francisco Giants (2012 & 2014), Boston Red Sox (2013) and Kansas City Royals (2015) all played their way into history with their recent World Series titles, but this year’s Cubs team made its own special mark, winning the title for the first time in over 100 years. That makes this championship wine truly historic as well. 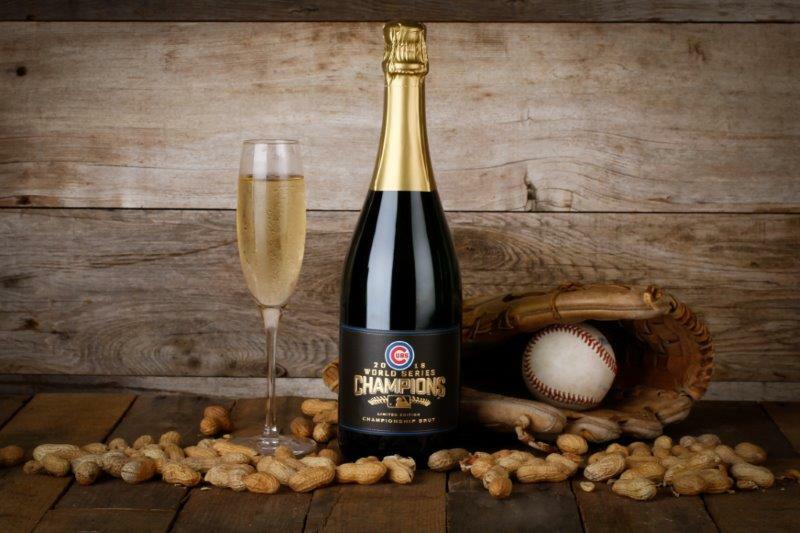 The Cubs Championship Brut was crafted in the labor-intensive méthode Champenoise tradition, and showcases premium grapes from California. With its expansion in 2014 to two new locations in Sonoma County, Rack & Riddle is proudly committed to providing pristine facilities where winemakers craft both still and sparkling wines. Rack & Riddle offers complete grape-to-bottle, base-to-bottle, and private label wine programs, and houses nearly 2 million gallons of stainless steel storage and fermentation vessels. An exceptional winemaking team produces 1.2 million cases of wine annually. For more information, visit www.rackandriddle.com. Wine by Design (WBD) is a marketing and management agency, and the leader in delivering wine-based strategic services and premium wine solutions. WBD provides tailored brand experiences, limited wine releases, events and consulting. Founded by Diane Karle, WBD has offices in New York and Napa Valley. WBD has cultivated a network of wine experts, suppliers and grape growers, which results in targeted business solutions. Visit winebydesignco.com to learn more. Rack & Riddle is California’s premier facility for custom crush and private label wine services specializing in full service or a la carte winemaking for still wines or méthode Champenoise sparkling. Rack & Riddle will work within your protocol to create an outstanding finished product. Contact Rack & Riddle, reservations are happening now for customized bottling or labeling services, or any step in the winemaking process you may need. Produced by winemakers who consistently win Gold and Best of Class in the most prestigious tastings! Interested in sparkling wine? Rack & Riddle offers complete sparkling wine production services, from base to bottle or grape to bottle, to private label sparkling programs. Request a custom crush quote or private label sparkling wine samples today. Special Offer from Rack & Riddle! 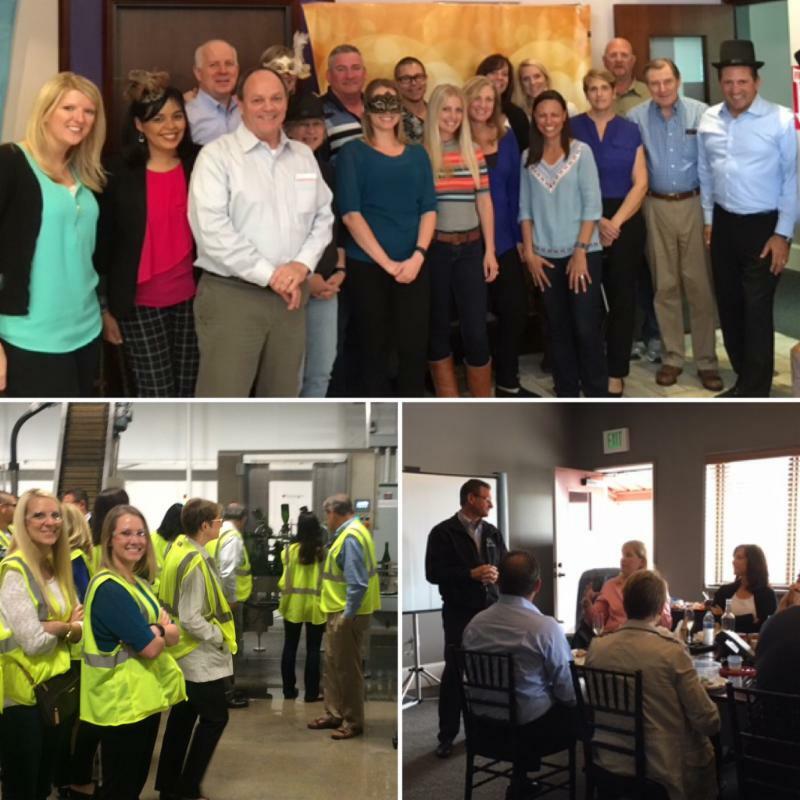 Educational tour & tasting for your team at Rack & Riddle. Learn how sparkling wine is made! An essential course in sparkling wine production for your entire team. Please allow 2 hours for your tour & tasting. Learn how traditional methods are combined with cutting-edge systems and technologies. Discover the descriptors unique to your private label wine, plus how to taste-and talk about-méthode Champenoise sparkling wine. Learn ways to get involved in your winemaking and production story--from the custom crush facility to sharing the story in your marketing and with your customers. Perfect for your tasting room, wine club, and events! Learn about custom crush processes for still wine and méthode Champenoise sparkling wine custom crush in this webinar recording from Rack & Riddle. Get expert advice and insider tips from Executive Winemaker, Penny Gadd-Coster to launch your next winemaking project at a custom crush facility without a hitch! We decided to call this webinar Custom Crush Demystified because there are several ways custom crush facilities can serve their clients. For example, some offer crush and storage, and some have bottling lines that take you all the way from grape to bottle. At Rack & Riddle, we’re a little bit different in that we offer full-service, customizable capabilities for grape to bottle, base to bottle or private label wine programs, or services a la carte. We’re one of the most comprehensive custom crush providers because we not only offer programs for still wine, we also specialize in méthode Champenoise sparkling wine custom crush. Did you know that Rack & Riddle can produce premium red or white still wines or méthode Champenoise sparkling wine from your base wine? With the guidance of our expert winemakers, you can produce your own sparkling wine from base-to-bottle. Rack & Riddle can tirage bottle, age, disgorge and then label your wine. Full-service sparkling wine production ensures your wine is in the best of hands from start to finish. If you're interested in either our grape-to-bottle or base-to-bottle services for still or sparkling wine, please contact us right away to book your project as space is limited! Base wine is typically brought in to our facility around December or January, but reservations for space are happening now. Wishing You a Happy Harvest! We’re excited to welcome new and returning customers in what is our 10th harvest this year. But make no mistake—our 80 employees bring decades of experience to the table. Rack & Riddle’s winemakers are led by Executive Director Penny Gadd-Coster, whose in-demand winemaking knowledge comes from 30 years’ experience backed by dozens of Best of Class, Gold Medals and 90-plus point ratings. Rack & Riddle offers complete services for both still wines or méthode Champenoise sparkling wines: Choose from grape-to-bottle or base-to-bottle programs, bottling contracts or services a la carte. An open door policy lets you freely take advantage of best-in-the-industry equipment, as well as Rack & Riddle’s unparalleled customer service and winemaking expertise. With all new equipment, including 150 bottle-per-minute Bertolaso still line, new riddling machines, Valentin corker, Perrier bottle turner, Cames bottle washer and Perrier disgorger/doser, Rack & Riddle is the No. 1 custom crush house in wine country. Don’t delay, reserve your spot today as space is very limited! Check out what winery clients are saying about Rack & Riddle—read the client testimonials. As you prepare for harvest, consider Rack & Riddle’s base to bottle program for méthode Champenoise sparkling wines. Bring your bulk wine to us in the first quarter of 2017, after it’s finished and ready for bottling or if it needs more processes before bottling. We can assist at any point in your base wine preparations! If you aren´t familiar with sparkling winemaking, that’s perfectly OK. With the guidance of our expert winemakers, you can make sparkling wine from base to bottle. Rack & Riddle can tirage bottle, age, disgorge and then label your wine. Our open door policy lets you be actively involved throughout the program. Rack & Riddle’s Executive Director of Winemaking Penny Gadd-Coster talks about customization of our base to bottle program, to meet clients’ exacting needs. Visit www.rackandriddle.com to explore the range of programs we offer, including grape to bottle, bottling contracts, and sparkling private label wines. Limited space is available for custom crush clients at Rack & Riddle, which is celebrating its 10th harvest this year! Rack & Riddle’s services include first-class still winemaking or méthode Champenoise sparkling winemaking: grape-to-bottle, base-to-bottle, bottling contracts, or services a la carte. Rack & Riddle’s open door policy lets you freely take advantage of first-rate equipment, winemaking expertise and unparalleled customer service. Rack & Riddle has all new equipment, including 150 bottle-per-minute Bertolaso still line, new riddling machines, Valentin corker, Perrier bottle turner, Cames bottle washer and Perrier disgorger/doser. Don’t delay, reserve your spot today as space is limited! Check out what winery clients are saying about Rack & Riddle—read the client testimonials! HAPPY (ALMOST) HARVEST FROM THE RACK & RIDDLE TEAM! Don't forget to stay updated with Rack & Riddle's current news, promotions, and upcoming events! With the arrival of spring, we winemakers find ourselves in the midst of full-blown prep and maintenance out in the vineyards, barreling toward harvest 2016! Signifying new beginnings, spring is the perfect time to launch the first of my “In the Vineyard” series. In this series of columns, I’ll be sharing my observations and what’s currently happening in the vineyard for my winery Coral Mustang at my home in Cloverdale, where I grow nine different red varietals. As I prep for harvest 2016, I look forward to checking back in with you throughout the year to share photos and interesting occurrences among the vines. Let me back up to set the stage. Last year Mother Nature wreaked havoc on my vineyards. While yields were low across Sonoma County, I was even less fortunate—my vines suffered from Millerandage, also known as “hens and chicks,” a fruit-set defect where underdeveloped and fully developed berries appear in the same cluster. With only a dozen berries per cluster on my vines—harvest was impossible at Coral Mustang. In my 30 years I’d never seen anything like it. Looking back at bloom I realized there had been two blooms—in my mind it was one very long bloom! This was due to weather conditions and the vines being determined to produce fruit no matter how cool the weather or how little water they had. Survival was the name of the game. After bloom things didn’t look too bad… Then the hens and chicks clusters became more evident with time, and with more chicks than hens. From the lessons of last harvest, I am leery of saying what 2016 will bring as bloom has not happened yet. This year, I’m hopeful for a 2016 crop, but also in “wait and see” mode. At this point, all nine different varietals in my vineyard have undergone bud break, after a warmer than usual winter. This is about average timing for the vineyard, which sits at an elevation of 800 feet above sea level. About two months ago I began late-pruning my vines, mainly because I couldn’t get into the vineyard before that due to El Niño—there was muck up to my waist! Full-on leafing was happening on the tips of the vines; I was concerned about extensive bleeding and the risks that can present, like odd molds or microbial issues; special paint can be used, but I’m not a fan. I decided to try a biodynamic farming trick on the recommendation of some of my vineyard workers. We pruned on the full moon—this was during the King tides, when the tides are especially high. It worked! As the vines were being pruned there was little to no bleeding. Even with the full leafing on my Tempranillo vines, there was no bleeding. I thought for sure there was going to be a mess, but with no bleeding, I haven’t seen any mold or microbial growth. I will be remembering this technique for the future. Last week I started the suckering process as the vines are growing pretty fast at this point and without being diligent they can get out of hand quickly with growth between spurs, extra growth on spurs and growth on the trunks—craziness ensues. For me this will become a biweekly event for the next couple of months. But caution is the key at this point as frost can still occur. I wish I had taken photos last year to see what the difference might be at this point due to the increased water from El Niño. But from the snapshot in my head, I do not recall the same vigor that I am seeing today. All I can say at this point is so far, so good—but then I say that every year! Until the next chapter in the series, cheers and happy grape growing! Space available now at Rack & Riddle for harvest 2016 projects! Still wine, sparkling wine, grape to bottle, bottling contracts and more – reserve early to secure space for your project! Learn the top 8 reasons your business needs a sparkling wine. 1) Sparkling Wine Sales Outpace Still Wine. The sparkling wine sector continues to outperform table wines. Check out our sparkling wine stats. 2) Custom Crush Makes it Easy. While making sparkling wine is expensive, a custom crush house like Rack & Riddle eliminates the costly equipment and overhead so any business can add bubbly to its portfolio. 3) Expand Your Brand. Tap into new branding concepts. Whether you’re a retailer offering bubbly to customers as a special promotion, or you’re unveiling a wine club, or sending clients your own branded bubbly as a thank you, the possibilities for branding – and boosting your image – are endless. 4) An Essential Event Marketing Tool. Imagine pouring bubbly featuring your custom-designed, branded label at trade shows, community events and non-profit fundraisers. As you pour the bubbles, you’ll have a captive audience and the perfect chance to chat up prospects. Gain exposure while also differentiating your business from others at events. Bonus: donations of bubbly to non-profit events are tax deductible. 5) Market to Millennials. Those ages 25 to 34 account for over 20 percent of sparkling wine drinkers, according to Impact, a sister publication of Wine Spectator. 6) Capture the Attention of Women. 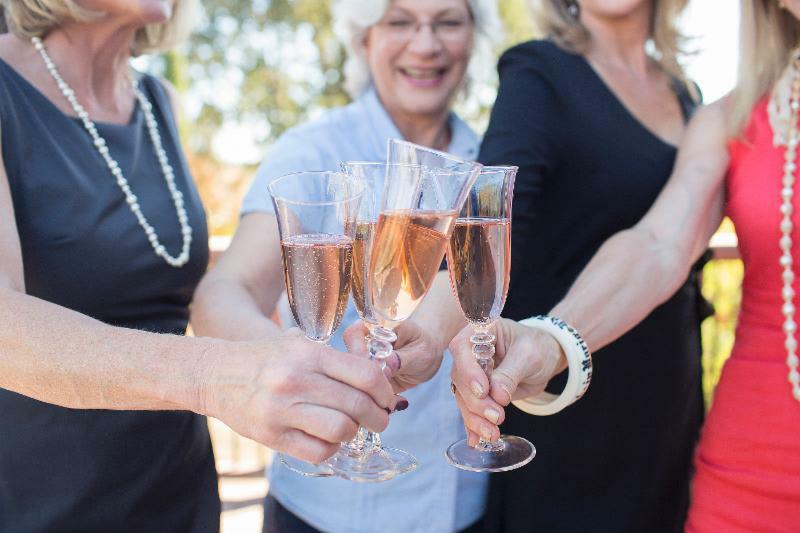 Women make up 64 percent of bubbly drinkers, according to the International Wine and Spirit Research (IWSR) consultancy. Women also make up over half of the core wine drinkers in the United States who drink wine on at least a weekly basis. 7) Sell Overseas. Worldwide, sparkling wine consumption is expected to rise 8.52 percent between 2012 and 2016 due to demand in the top four sparkling wine markets: the United States, Germany, France, and Russia, according to IWSR. 8) California: Bubbly Capital of the United States. If your market is local, you’ll be glad to know the top state for sparkling wine consumption is California. The top 10 states, according to an October 2014 study by The Beverage Information Group, are: California, Illinois, New York, Florida, Texas, Michigan, New Jersey, Pennsylvania, Massachusetts and Ohio. Ready to explore what sparkling wine can do for your business? Give Rack & Riddle a call at 707-433-8400. Request a quote for private label wine or request sparkling samples. Have your own base wine for a bubbly project? Request a quote for custom crush services. Rack & Riddle will be at the Eastern Winery Expo March 9-10th, and available during the event for consultations about our services. Visit booth #172 to taste award-winning private label sparkling wine samples, and meet Rack & Riddle GM Mark Garaventa. Rack & Riddle offers award-winning, méthode Champenoise private label wines to help you grow your brand. This VIP pass also entitles the user to receive a free lunch on Thursday, March 10th in the exhibit hall! Rack & Riddle's sparkling private label wines (shiners) have won dozens of awards for a host of brands, including these top honors: Best of Class, Double Gold, Gold, and Sweepstakes awards. All these awards (and more than 100 additional awards over the past few years) were garnered for our private label base varietals, made unique via differing times en tirage, and custom dosage trials. You can rest assured a Rack & Riddle sparkling wine will truly be your very own. Request sparkling private label samples here. Rack & Riddle offers award-winning, méthode Champenoise private label wines to help you grow your brand. Call 707-433-8400 to ask us about this program and request samples below. Schedule a Private Appointment to Meet Rack & Riddle at Unified! Taste sparkling wine samples and discover our complete custom crush services at booth #1839. With sparkling wine growing ever more popular and sales far outpacing still wine, now is the ideal time to carve your niche in this lucrative market. 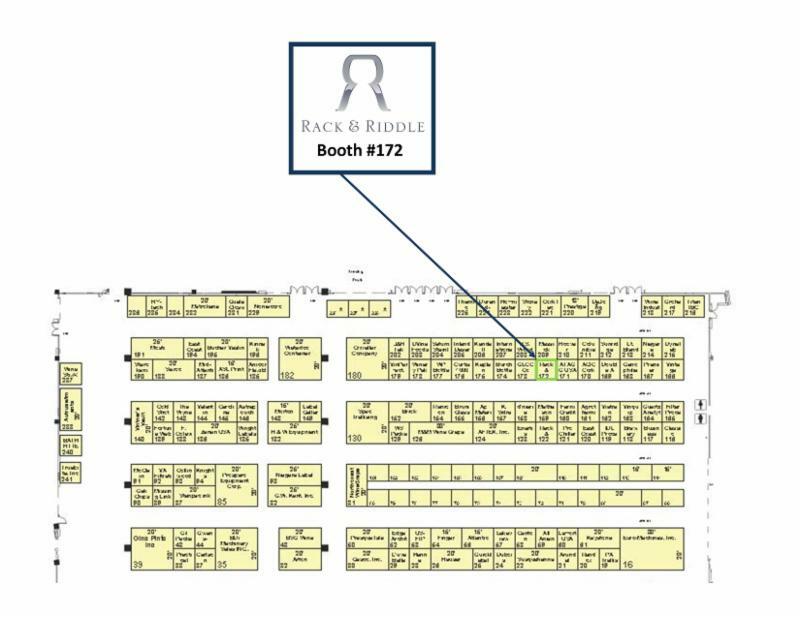 Stop by and taste samples of Rack & Riddle's award-winning sparkling wine at booth #1839 at the 2016 Unified Wine Symposium in Sacramento (Wednesday January 27th through Thursday the 28th). Rack & Riddle's Sparkling Private Label (Shiner) Wines have won dozens of awards for a host of brands, including these top honors: Best of Class, Double Gold, Gold and Sweepstakes awards. All these awards (and more than 100 additional awards in recent years) were garnered for our varietals of private label bubbly, made unique via differing times en tirage, and custom dosage trials. You can rest assured a Rack & Riddle sparkling wine will be your very own! Wine industry veterans Rebecca Faust and Bruce Lundquist often heard winemakers lament: Making sparkling wine is too cost prohibitive; the learning curve too steep. Yet sparkling wine sales have been outpacing still wine for nearly a decade—everybody wanted in. A lightbulb turned on. This was the perfect, untapped niche: Rack & Riddle would be an operation where wineries, winemakers and brands could access still and sparkling custom crush services—from base wine or grapes, or any winemaking process in between—as well as private label wines. Rack & Riddle has grown from eight employees at its founding in 2007 to over 80 today, expanded in 2014 to two facilities based in Sonoma County, and is one of the largest operations in the nation specializing in the traditional French sparkling winemaking style of méthode Champenoise. Projects at Rack & Riddle are varied and truly custom. Clients elect to bring in grapes or base wine, or choose from winemaking processes a la carte, such as bottling finished wines, or aging wines in barrel. The private label wine program is ideal for those seeking a branded label with a quick turn-around time. Orders average just three months from placing an order, to receiving government label approval to being labeled and packed in cases ready to ship. Private label customers range from wineries and restaurants to retail stores, gift basket companies and more. “A lot of our customers start their wine program with a private label wine. In the meantime, they can prepare to bring in their own grapes or base wine down the road. This is a really useful strategy to get their wine program established in the marketplace,” said Gadd-Coster. Rack & Riddle Winery also has its own brand of four award-winning sparkling wines, which have been awarded 20 Gold medals and Best of Class awards in just the past few years. The wines can be purchased in select stores across California and numerous states nationwide, and in 27 states online at www.rackandriddle.com. Breathless Wines, Rack & Riddle’s sister winery, will open a tasting room adjacent to Rack & Riddle’s sparkling wine facility at 499 Moore Lane in Healdsburg, Calif., in early 2016. Founded by sisters Rebecca Faust (Rack & Riddle’s co-founder), Sharon Cohn and Cynthia Faust, Breathless’ tasting room will feature three sparkling wine varietals in an innovative space—the first of its kind in Healdsburg constructed out of a shipping container. Guests enjoy a world class tasting experience complete with sabering lessons, in a space devoted to supporting more than a dozen non-profit partners. With a multitude of programs running at once, Rack & Riddle emphasizes customer satisfaction is key. As a custom crush facility that produces over 1.2 million cases annually and a team with over 100 years’ combined expertise, Rack & Riddle’s No. 1 goal is for clients large and small to know they are in the best of hands. Give Rack & Riddle a call or visit the website to request your custom crush quote today! Or request sparkling private label (shiner) samples online! Rack & Riddle Custom Wine Services, one of the largest custom wine operations in the nation, announced the release of the Kansas City Royals World Series Championship Brut sparkling wine. Product is available for sale online and at select retail outlets. For more information visit, mlb.com/wine. Wine by Design, an official licensee of Major League Baseball, identified Rack & Riddle as the ideal partner to produce this limited-release commemorating the champions of the 111th Fall Classic. The Royals Championship Brut was crafted in the méthode Champenoise process, and showcases premium grapes from California’s renowned North Coast region. Rack & Riddle produced its first MLB wine in 2013, a championship brut for the Boston Red Sox. Follow this link to register with our code already applied! The Rack & Riddle team is excited to announce we will have a booth at the upcoming North Coast Wine Industry Expo on Thursday, December 3rd! 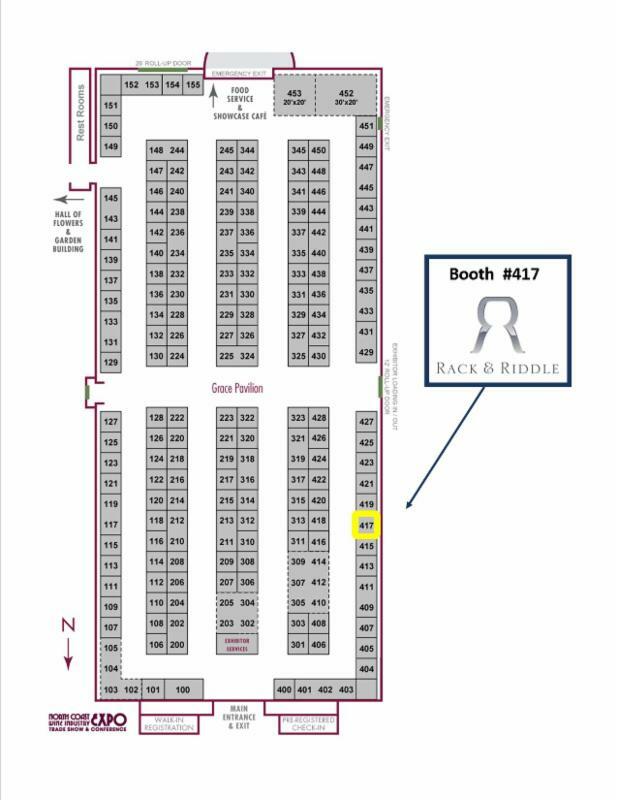 Don't forget to stop by our booth #417 at the expo to taste Rack & Riddle sparkling wines and check out our custom crush and private wine label services. SPECIAL OFFER: $12 Off Per Case for 5-Pallet Sparkling Brut Shiner Orders Made at the Show! Ask about our custom crush services for producing still and sparkling wines from your own grapes or base wine, or any winemaking need in between! Visit our website to request quotes or samples online! Rack & Riddle's Sparkling Private Label (Shiner) Wines have won dozens of awards for a host of brands, including these top honors: Best of Class, Double Gold, Gold, and Sweepstakes awards. All these awards (and more than 100 additional awards over the past three years) were garnered for just four base varietals of bubbly, made unique via differing times en tirage, and custom dosage trials. You can rest assured a Rack & Riddle sparkling wine will truly be your very own! Don't forget to stay updated with Rack & Riddle's current news, promotions and upcoming events! SPECIAL OFFER - North Coast Wine Industry Expo! Learn the top 8 reasons your business needs a sparkling wine. Ready to explore what sparkling wine can do for your business? Give Rack & Riddle a call at 707-433-8400. Click to request a quote for your own private label sparkling wine. Have your own base wine for a bubbly project? Click to request a quote for custom crush services. 1) Sparkling Wine Sales Outpace Still Wine. The sparkling wine sector outperformed table wines for the sixth consecutive year in 2014, as Shanken News Daily reported, and in the first quarter of 2015, sparkling wine boosted online wine sales by 11 percent, according to Wilson Drinks Report. “The sparkling wine surge has continued in 2015, with total sparkling wine value up 16 percent,” says Wilson Drinks Report Managing Director Tim Wilson. 7) Sell Overseas.Worldwide, sparkling wine consumption is expected to rise 8.52 percent between 2012 and 2016 due to demand in the top four sparkling wine markets: the United States, Germany, France, and Russia, according to IWSR. 8) California: Bubbly Capital of the United States.If your market is local, you’ll be glad to know the top state for sparkling wine consumption is California. The top 10 states, according to an October 2014 study by The Beverage Information Group, are: California, Illinois, New York, Florida, Texas, Michigan, New Jersey, Pennsylvania, Massachusetts and Ohio. Ready to explore what sparkling wine can do for your business?Give Rack & Riddle a call at 707-433-8400. 6 Varietals of Private Label Wines Available! Call us for more details or to request a quote! 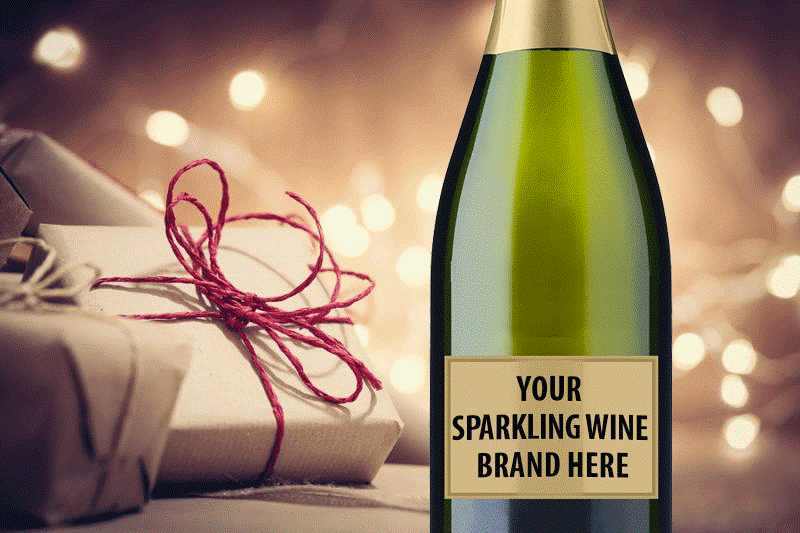 Roll out your new sparkling wine brand in time for the holidays! It's easy with Rack & Riddle Custom Wine Service's sparkling Private Label Wine program. Imagine launching your own brand’s méthode champenoise sparkling wine in time for the holidays. 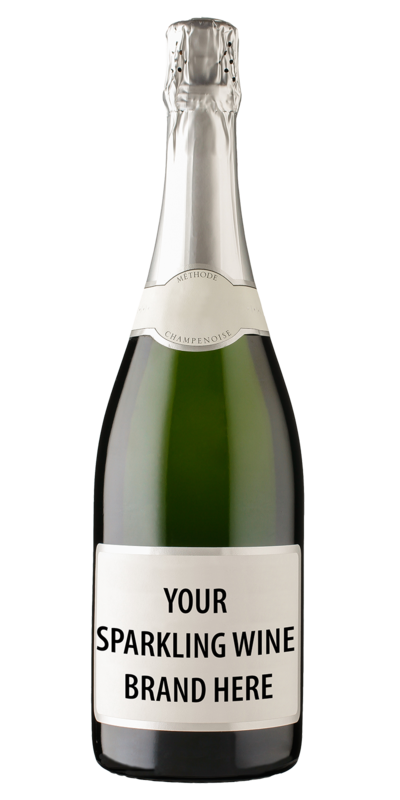 A bubbly with a branded label is perfect for your company’s parties, holiday promotion, customer gifts, or employee gifts. By starting now, you can launch a new bubbly in time for December! Such a fast turn-around time is possible in the private label “shiner” program here at Rack & Riddle. Our customizable offerings include a selection of award-winning sparkling wines; differing aging times en tirage and a custom dosage option ensures your wine is truly unique for your brand. Clients can expect to profit as much as 50 percent or more with a private label bubbly (depending on the retail price they decide upon). With sparkling wine growing ever more popular and sales far outpacing still wine, now is the ideal time to carve your niche in this lucrative market. Here are some tips and a general timeline to keep in mind when pursuing a private label bubbly project. 1). Contact Rack & Riddle to request the latest sparkling wine availability sheet and request samples. When your team has tasted and selected your bubbly, request a quote. Once the quote is signed and deposit made, your wine order is secured! We’ll send you the wine technical data so you can get started thinking about the information to include on your label design, and start writing your wine (or brand) description for your back label. Now is also a great time to start a marketing plan for your new bubbly! 2). 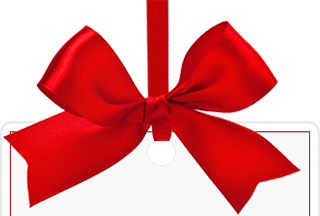 Submit your completed New Customer Application (only for customers who haven’t ordered before). 3). Complete our DBA letter template to be added on our basic permit. This is standard procedure for any custom crush/private label order, and required of all clients so you can print labels stating your own business name on the “produced by” line. 4). Submit a completed Shiner Spec Sheet with information like foil color you would like, and any special instructions for your project’s labeling. Start your label design process early with a graphic designer, preferably one who is familiar with designing wine labels. Never designed a wine label before? No problem. We have a compliance specialist on-staff who will provide guidelines and get you all set. Check out our Sparkling Label Spec Sheet for recommended label printers. But remember, don’t get your labels printed until you have a COLA (certificate of label approval), which we will submit for you. Once your label artwork is finished, you’ll email us the jpegs to submit for the COLA on your behalf. Keep your eye on the TTB’s processing times, as they vary. Right now, as of this publication, it’s taking the TTB 23 days to review and approve wine labels. Let your label printing company know the expected COLA date – they can get you scheduled for printing as soon as you have the COLA. When your COLA comes through, we’ll email it to you. Now you can print your labels! It often takes a label printing company two weeks’ turn-around, so it’s wise to get on their production schedule early. After your labels are printed, ship them to us and we’ll get your project on our production schedule for labeling. A sparkling private label project is typically scheduled for labeling within two to four weeks after we receive your labels. If you want to label and/or foil off-site and take your wine as “shiners” (unlabeled) you certainly can! There’s a spot to let us know that on your Shiner Spec Sheet. The Rack & Riddle team hand-labeling advance sample cases for a private label client. Once you have your production date for labeling, you can contact us if you’d like to come to the facility to watch the magic happen! Next, your labeled bottles are placed in sturdy upright white wine cases, ready to ship. Congratulations on your new sparkling wine brand! We hope this information is helpful as you consider launching your own branded bubbly. For more information about Rack & Riddle’s programs or to schedule a tour for a behind-the-scenes look at our production facilities, please don’t hesitate to call us at 707-433-8400. We have space available for your still or sparkling custom crush projects this harvest! -Ship your wine or grapes to us, and we'll work within your protocol to create an outstanding finished product! 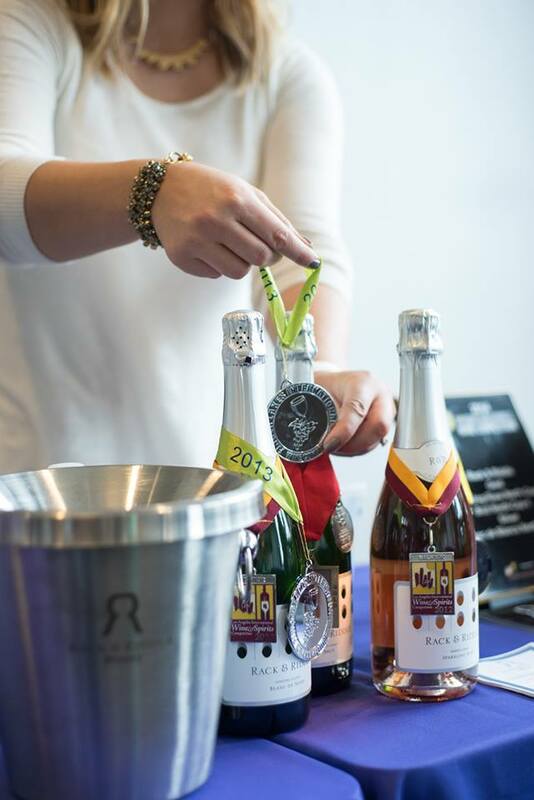 Sparkling wines produced at Rack & Riddle have won top awards for a host of brands, including: Best of Class, Double Gold, Gold, and Sweepstakes awards. Director of Winemaking Penny Gadd-Coster leads a stellar team of six award-winning winemakers to help with your project. Our staff of more than 80 employees are experts in their specialties, from production to the cellar to compliance, and everything in between. Rack & Riddle's custom crush programs are truly customizable -- we can be as hands on or off as you like, offering more than 100 years of combined winemaking expertise in both still and sparkling winemaking. Let us follow your protocol to produce a world-class, award-winning wine! Contact us with any questions or to discuss your project! Custom Crush Space Available for Still or Sparkling Wine Projects! Rack & Riddle has space available this harvest for your still or sparkling custom crush projects! Space is limited, and harvest has already begun for sparkling winegrapes, so contact us now to reserve space for your project! We would love to discuss your project! Email us or give us a call at 707-433-8400. 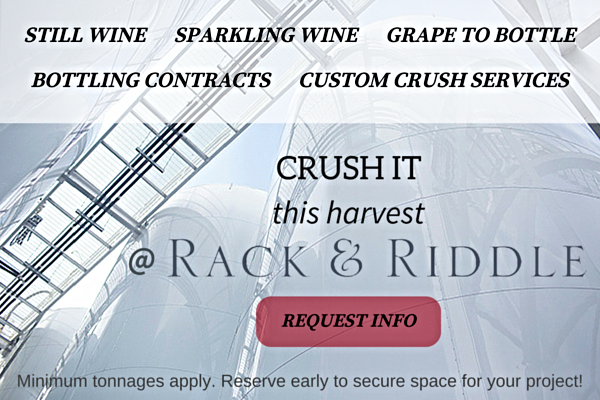 Rack & Riddle has space available this harvest for your still or sparkling custom crush projects! We would love to discuss your project. Email us or give us a call at 707-433-8400. Did you know that Rack & Riddle can produce premium, méthode champenoise sparkling wine from your base wine? If you're interested in our base-to-bottle services, please contact us right away to book your project; base wine is typically brought in to our facility around December or January, but reservations for space are happening through the summer! • 11% is the preferred alcohol percentage for the wine coming in. • We aim for the finished product to be in the 12.5% to 13% range. • 3.1 pH is ideal, but it is adjustable if wine comes in at a lower or higher pH. Wishing You a Wonderful Summer and a Happy Harvest! Rack & Riddle on ABC! We had fun showing "Days with Zahrah" around the custom crush facility, plus visiting the Breathless tasting room, where our Executive Director of Winemaking Penny Gadd-Coster led us through an educational tasting of a flight of Breathless bubbly. -Ship your base wine or grapes to us, and we'll work within your protocol to create an outstanding still wine! -Customized bottling or labeling services, or any step in the winemaking process you may need! Don’t wait! Request a quote for your private label or custom crush project. Rack & Riddle Custom Wine Services is featured in The Press Democrat's article this week about the growing private label wine market. "The outlook also is bright over at Rack & Riddle in Healdsburg, where general manager Mark Garaventa notes that its private label production is expected to grow from 35,000 cases last year to 50,000 cases in the coming years..."
Visit our website to find out more about Rack & Riddle's private label wine program. 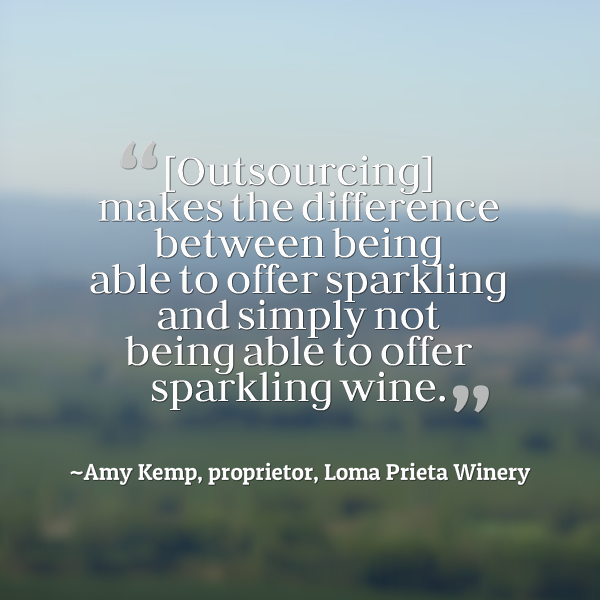 Request a quote online, or request your sparkling wine samples! Contact us at 707-433-8400 for more information. See first-hand with the below infographic how Rack & Riddle’s private label and custom crush sparkling wines are crafted in the traditional method! Request sparkling wine samples or a quote in one click. 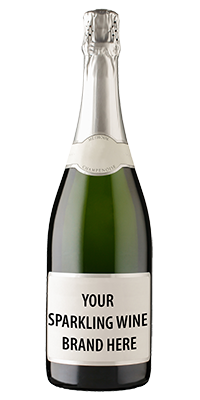 Find out how easy it is to add private label sparkling wine to your portfolio! Request a quote for privately labeled wine here. Request samples here. Learn the top 8 reasons why your business needs a private label sparkling wine. 1) Sparkling Wine Sales Outpace Still Wine Sales. Sparkling wines are driving the growth of the United States’ wine market. The sparkling wine sector outperformed table wines for the sixth consecutive year in 2014, as Shaken News Daily reported in the November 2014 article, “U.S. Wine Market to Rise for 21st Consecutive Year”. 2) Custom Crush Makes it Easy. While sparkling winemaking is a more expensive, time-intensive process than crafting a still/table wine, custom crush houses like Rack & Riddle eliminate the costly equipment and overhead so any business can add bubbly to its portfolio. 3) Elevate Your Brand. Tap into new branding concepts. Whether it’s a restaurant offering customizable private labels for wedding clients, a store offering a bubbly blend to its rewards program members, or unveiling a wine club or holiday-themed bubbly label, the possibilities for branding – and boosting your image – are endless. 4) An Essential Event Marketing Tool. Imagine pouring bubbly featuring your custom-designed label at trade shows, community events and non-profit fundraisers. Nothing draws attention to your logo better than it being prominently on the label of a sparkling wine. Plus, as you pour the bubbles, you’ll have a captive audience and the perfect chance to chat up prospects. Gain exposure while also differentiating your business from other trade show booths or event sponsors. Bonus: donations of bubbly to non-profit events are tax deductible. 5) Market to Millennials.Those ages 25 to 34 account for over 20 percent of sparkling wine drinkers, according to Impact, a sister publication of Wine Spectator. 6) Capture the Attention of Women.Women make up 64 percent of bubbly drinkers, according to the International Wine and Spirit Research (IWSR) consultancy. Women also make up over half of the core wine drinkers in the United States who drink wine on at least a weekly basis. Ready to explore what sparkling wine can do for your business? Give Rack & Riddle a call at 707-433-8400. Click to request a quote for your own private label sparkling wine. Have your own grapes or base wine? Click to request a quote for custom crush services. At the WiVi Tradeshow in Paso Robles, be sure to stop by Rack & Riddle's booth #306 to taste award-winning sparkling wine samples and learn about our services. During the week of WiVi, Rack & Riddle is available for one-on-one consultations about our services. Let us bring sparkling wine samples straight to your winery, when it's convenient for you. Limited appointments are available from Monday, March 16—Thursday, March 19, so call or email Business Development Associate Monica Smith to secure your personal visit! Rack & Riddle is pleased to offer a FREE Tradeshow Pass to the upcoming WiVi Tradeshow in Paso Robles (a $30 value) to our friends and clients! Visit Rack & Riddle’s booth #1232 to taste sparkling wine samples and learn about our services. Rack & Riddle is pleased to offer a FREE Exhibit Pass to the upcoming Eastern Winery Expo in Syracuse! 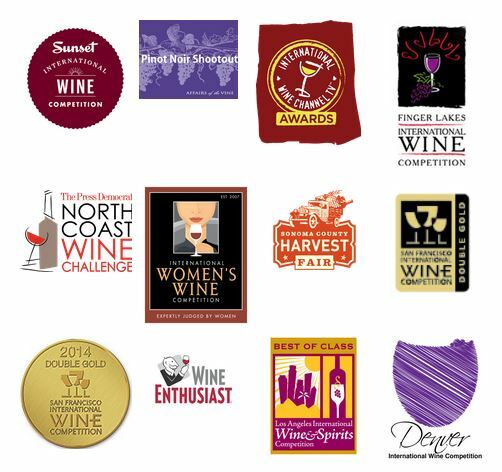 RACK & RIDDLE SPARKLING PRIVATE LABELS HAVE WON OVER 100 AWARDS! brands, including these top honors in the past year alone: Best of Class, Double Gold, Gold, and Sweepstakes awards. dosage trials. You can rest assured a Rack & Riddle sparkling wine will truly be your very own! Special Offer for Central Coast Winery Owners! Rack & Riddle is coming to your area, and we'd love to meet with you to discuss your winemaking program for 2015, and how Rack & Riddle can help! During the week of WiVi, Rack & Riddle is available for one-on-one consultations about our services. Let us bring sparkling wine samples straight to your winery, when it's convenient for you. Limited appointments are available from Monday, March 16th--Thursday, March 19th, so call or email Business Development Associate Monica Smith TODAY to secure your personal visit! 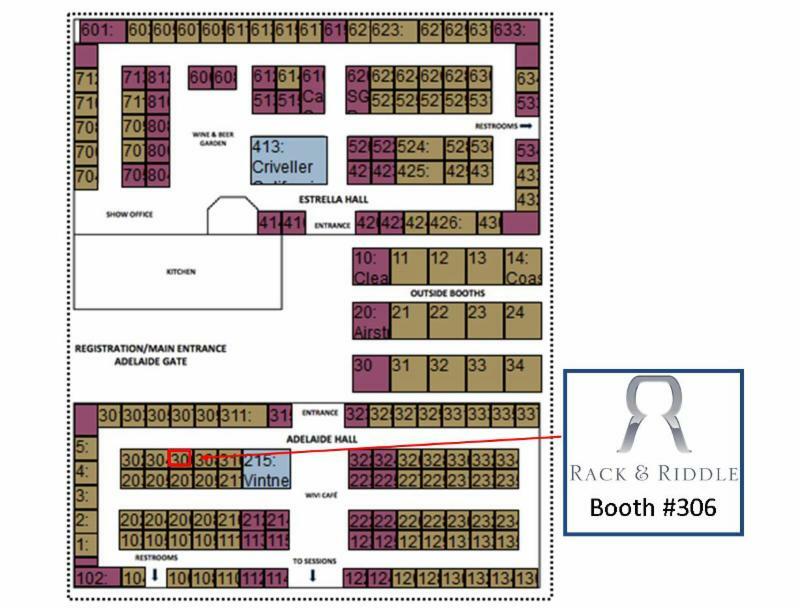 At the WiVi Tradeshow in Paso Robles, be sure to stop by Rack & Riddle's booth #306 to taste award-winning sparkling wine and meet one-on-one with our knowledgeable staff during the tradeshow. The exhibit is open 10am-5pm, Wednesday, March 18th. Rack & Riddle's Sparkling Private Label (Shiner) Wines have won dozens of awards for a host of brands, including these top honors in the past year alone: Best of Class, Double Gold, Gold, and Sweepstakes awards. All these awards (and more than 100 additional awards over the past few years) were garnered for just four base varietals of bubbly, made unique via differing times en tirage, and custom dosage trials. You can rest assured a Rack & Riddle sparkling wine will truly be your very own! WE HOPE TO SEE YOU AT WiVi! Schedule Your Personal Consultation with Rack & Riddle at Unified! Celebrate New Profits in 2015 – Add Sparkling Or Still Wine to Your Portfolio! Or click here to add us to your show planner and send an email to book your appointment! Taste samples of Rack & Riddle’s award-winning sparkling wine, and meet our sales and winemaking staff members at booth #1839 during the Unified Wine Symposium in Sacramento, Calif. January 28-29th. Learn about Rack & Riddle’s services, including: Private label sparkling and still wines; custom crush services for both sparkling and still wines; complete base-to-bottle and grape-to-bottle programs; and any winemaking or bottling need in between! Don’t wait! Book an appointment to meet one-on-one with our knowledgeable staff and discover how Rack & Riddle’s collaborative, customer-centered approach can help you achieve your winemaking goals for 2015. Meet Rack & Riddle at Unified! Taste samples of Rack & Riddle’s award-winning sparkling wine, and meet our sales and winemaking staff members at booth #1839 during the Unified Wine Symposium in Sacramento, Calif. Learn about Rack & Riddle’s services, including: Private label sparkling and still wines; custom crush services for both sparkling and still wines; complete base-to-bottle and grape-to-bottle programs; and any winemaking or bottling need in between! Book an appointment to meet one-on-one with our knowledgeable staff and discover how Rack & Riddle’s collaborative, customer-centered approach can help you achieve your winemaking goals for 2015. Celebrate New Profits in 2015 – Add Sparkling Or Still Wine to Your Portfolio! Book Your Appointment to Meet Rack & Riddle Now! HEALDSBURG, Calif., Dec. 9, 2014 – Rack & Riddle Custom Wine Services, one of the largest custom wine operations in Northern California, has announced the rollout of its five new non-vintage private label sparkling wine blends, which follows on the heels of the company’s major Sonoma County expansion. Rack & Riddle found its niche as one of the few custom crush winemaking facilities in the nation specializing in méthode champenoise sparkling wines. Rack & Riddle’s sparkling blends consistently garner Gold and Best of Class honors in major wine competitions throughout the United States. Retailers are increasingly choosing to add sparkling wine to their portfolios as more and more consumers buy bubbly. 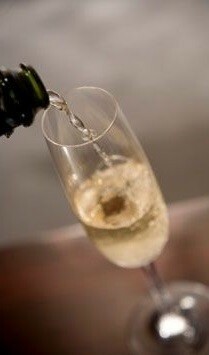 The consumption of sparkling wine is projected to rise 8.52 percent worldwide between 2012 and 2016 due to increased demand in the top four sparkling wine markets: the United States, Germany, France, and Russia, according to the International Wine and Spirit Research (IWSR) consultancy. Sparkling wine consumption rose 4.17 percent compared to the 2.72 percent increase seen in still wines from 2007 to 2011. With a recent expansion to two new locations in Sonoma County, Rack & Riddle is proudly committed to providing pristine facilities where winemakers craft both still and sparkling wines. Rack & Riddle offers complete grape-to-bottle, base-to-bottle, and private label programs, and houses nearly 2 million gallons of stainless steel storage and fermentation vessels. An exceptional winemaking team produces over 1 million cases of wine annually. For more information, please visit www.rackandriddle.com. Champagne Cocktail & Meet the Winemaker Event at Rack & Riddle! When: Oct. 25th, from 11 a.m. to 1:30 p.m. Please accept our invitation to see Rack & Riddle's new winemaking facility in Alexander Valley, while meeting our winemaker Penny Gadd-Coster and other Rack & Riddle team members! 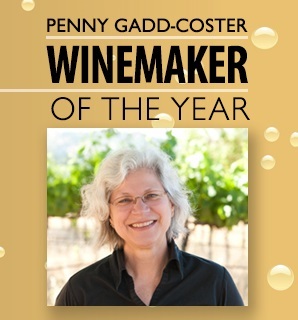 Penny Gadd-Coster, winner of "Winemaker of the Year" in the North Bay Business Journal's inaugural Wine Industry Awards, has garnered 14 Gold and Best of Class honors for Rack & Riddle's four varietals of bubbly in the past year alone! At our event, learn about Rack & Riddle's Sparkling Wine Club. Averaging only $50 per shipment for three bottles, three times per year, our members also get 25% off any wine or apparel purchase, plus much more! Enjoy R&R bubbly paired with delicious hors d' oeuvres, plus a delightful Autumn themed champagne apple cider cocktail with recipe you can take home with you! UPDATE: Due to Harvest and logistics of recieivng and processing grapes at this facility, we feel that the event as intially advertised for Sept. 27th will suffer. Please stay tuned as we will soon announce the new date for this event, which will be rescheduled to a weekend date in October. Rack & Riddle Co-Owner Rebecca Faust cutting the ribbon. 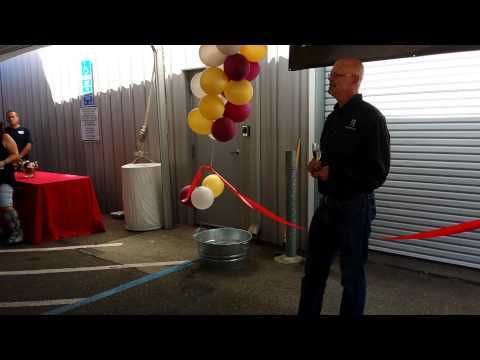 HEALDSBURG, Calif., Aug. 28, 2014 – Rack & Riddle Custom Wine Services, one of the largest custom crush operations in Northern California, celebrated the grand opening and ribbon cutting of its new Healdsburg facility on Wednesday. 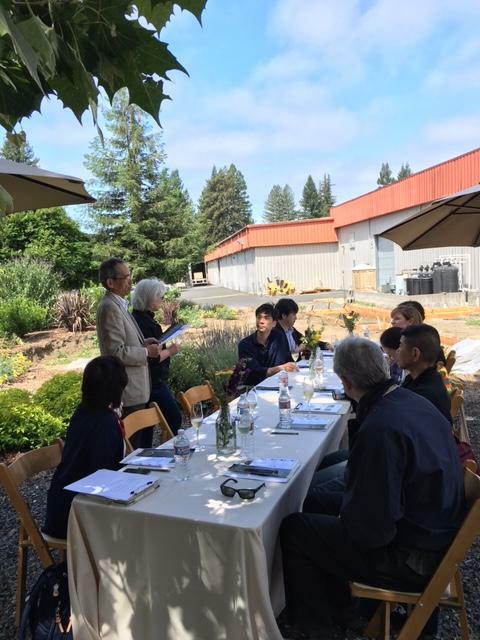 Approximately 200 guests attended the event, including Healdsburg city and Chamber of Commerce officials, preeminent wine industry figures and the area’s top winemakers. Guests were guided on behind-the-scenes tours of the facility, and enjoyed Rack & Riddle sparkling wines, wood-fired pizza by Diavola Pizzeria and live music performed by The Delta Rockets. In a speech to the large crowd of 150-plus people gathered underneath the white tent for the 2:30 p.m. ribbon cutting, Rack & Riddle co-owner Bruce Lundquist thanked the many people who helped make the new 67,000-square-foot winemaking facility a reality. “We’ve had a fairly tumultuous four or five months moving down here from Hopland—it’s a little bit ironic we actually started our business partnership here in Healdsburg, started our first business operations in Hopland, and eight years later we find ourselves back in Healdsburg, and we’re happy to be back here,” said Lundquist. In just nine months’ time over the past year, Rack & Riddle expanded its footprint to 120,000 square feet in Sonoma County via its Alexander Valley location at 4001 Hwy 128 in Geyserville, dedicated to crushing and fermenting, and the new Healdsburg facility, located a few blocks from the Healdsburg town square at 499 Moore Lane. The Healdsburg facility focuses on all phases of sparkling winemaking and bottling, as well as still wine bottling, white wine fermentation, and alternative wine packaging including pouching and kegging. Having grown from eight employees when founded in 2007 to more than 50 today, Rack & Riddle has seen its business increase 42 percent the past two years. Rack & Riddle found its niche as one of only a handful of custom crush facilities in the nation specializing in méthode champenoise sparkling wines—a labor-intensive process that involves secondary fermentation in the bottle. Rack & Riddle offers full custom services for sparkling wines as well asstill red and white wines. Among its offerings are complete base-to-bottle, grape-to-bottle and “shiner” programs (pre-bottled wines available to purchase for application of customers’ private brand labels). Rack & Riddle unlocks the ability for wineries, businesses or individuals to create a private label wine, without the overhead and investment of owning a winery. With a recent expansion to two new locations in Sonoma County, Rack & Riddle is proudly committed to providing pristine facilities where winemakers craft both still and sparkling wines. Rack & Riddle offers complete grape-to-bottle, base-to-bottle, and shiner programs for private labels, and houses nearly 2 million gallons of stainless steel storage and fermentation vessels. An exceptional winemaking team produces over 1 million cases of wine annually. For more information, please visit www.rackandriddle.com. Rack & Riddle Custom Wine Services, one of the largest custom crush and winemaking companies in the North Bay area, provides “shiners” or “clean skins” as winemakers in Australia call the phenomenon—unlabeled wine for application of businesses’ or individuals’ own brand labels. Contact Rack & Riddle at 707-433-8400 for information on receiving $12 off per case as part of the Rack & Riddle Healdsburg Grand Opening sale – only two weeks are left for these great savings. Rack & Riddle stands apart as one of the only providers of a wide selection of both still wine and sparkling wine shiners, and specializes in sparkling wines made in the méthode champenoise tradition—a labor-intensive and expensive process that involves second fermentation in the bottle. 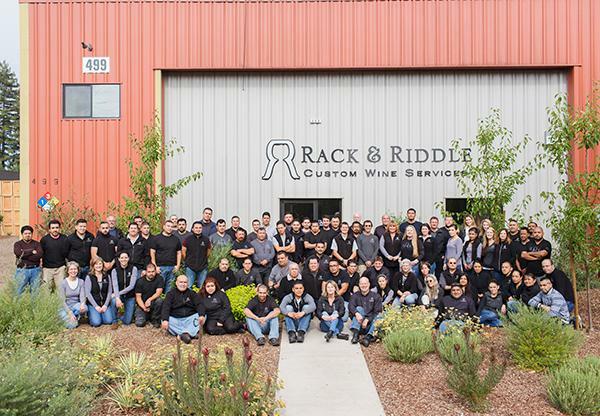 Rack & Riddle recently opened a second facility in the booming wine country of Healdsburg, Calif. This allows customers’ brand labels to state their business name/wine brand as being produced and bottled in Healdsburg. “The name ‘Healdsburg’ is a powerful marketing tool, as it holds a lot of cache,” said Gadd-Coster. Wineries are wise to offer sparkling wine, as the International Wine and Spirit Research (IWSR) research consultancy predicts worldwide consumption rates of sparkling wine will outpace that of still wines between 2012 and 2016. From 2007 to 2011, sparkling wine consumption increased 4.17 percent, compared to the 2.72 percent increase seen in still, light wines during the same period. The consumption of sparkling wines is projected to rise 8.52 percent between 2012 and 2016, due to expected consumption increases in the top four sparkling wine markets: the United States, Germany, France, and Russia, according to IWSR. Rack & Riddle’s Sonoma County expansion poises the company as one of the largest custom crush facilities specializing in sparkling wine in California. Rack & Riddle anticipates significant growth through increased bottling, stainless steel tank and tirage storage capacity. As a result of the Alexander Valley expansion, 15 new jobs were created at Rack & Riddle; additional new jobs will be created in coming months. In the past two years, Rack & Riddle has seen business soar by 40 percent. Production in 2011 grew from 700,000 cases a year to 850,000 cases the following year. In 2013, the company produced more than 1 million cases of wine on behalf of well over 100 winemaking clients. Rack & Riddle was founded in 2007 with just eight employees and today has more than 50 employees. 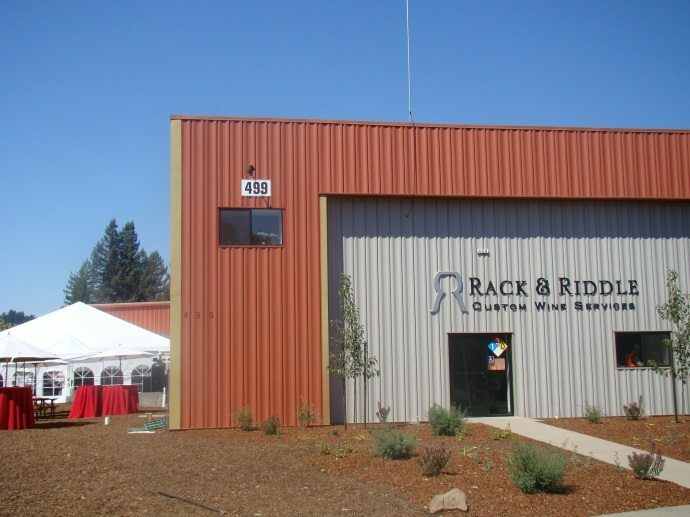 HEALDSBURG, Calif., August 5, 2014 – Rack & Riddle Custom Wine Services, one of the largest custom crush and winemaking companies in the North Bay area, today announced its new Healdsburg facility is fully operational. The 67,000-square-foot facility focuses on complete sparkling winemaking production, white wine fermentation and still wine bottling. A grand opening and ribbon cutting ceremony will take place August 27th from 2 p.m. to 6 p.m. for the new wine production facility, which has been undergoing improvements since Rack & Riddle’s long-term lease of the building began in October. Rack & Riddle invites those in the wine industry or members of the media to RSVP to attend the grand opening by calling 707-433-8400. Tours of the facility will take place throughout the event. Rack & Riddle has occupied its Alexander Valley location at 4001 Hwy 128 in Geyserville, dedicated to crushing and fermenting, since January 1st. The Healdsburg facility, located a few blocks from the Healdsburg town square at 499 Moore Lane, focuses on all phases of sparkling winemaking and bottling, as well as still wine bottling, white wine fermentation, and alternative wine packaging including pouching and kegging. Rack & Riddle made a full transition out of its original Hopland location – where it was based for seven years – at the end of May, 2014. The departure made way for the Hopland building’s new occupant, Duckhorn Wine Co., which is unaffiliated with Rack & Riddle. The Sonoma County expansion poises Rack & Riddle as one of the largest custom crush facilities specializing in sparkling wine in California. Rack & Riddle anticipates significant growth through increased bottling, stainless steel tank and tirage storage capacity. As a result of the Alexander Valley expansion, 15 new jobs were created at Rack & Riddle; additional new jobs will be created in coming months. In the past two years, Rack & Riddle has seen business soar by 40 percent. Production in 2011 grew from 700,000 cases a year to 850,000 cases the following year. In 2013, the company produced more than 1 million cases of wine on behalf of well over 100 winemaking clients. Rack & Riddle was founded in 2007 with just eight employees and today has over 50 employees. If you're interested in our base-to-bottle services, please contact us right away to book your project; base wine is typically brought in to our facility around December or January, but reservations for space are happening now! 11% is the preferred alcohol percentage for the wine coming in. We aim for the finished product to be in the 12.5% to 13% range. 3.1 pH is ideal, but it is adjustable if wine comes in at a lower or higher pH. HEALDSBURG, Calif., April 23, 2014 – Rack & Riddle Custom Wine Services, one of the largest custom crush and winemaking companies in the North Bay area, today announced its new Healdsburg facility is expected to be functionally operational June 15th, with full capabilities expected August 1st. A grand opening and ribbon cutting ceremony is slated for August 27th for the new wine production facility, which has undergone improvements since October. “We’re thrilled to have expanded our Sonoma County footprint to some 120,000 square feet over the course of just nine months,” said Bruce Lundquist, co-owner of Rack & Riddle. “It’s been a long-held goal to offer our clients more winemaking options and increased production capabilities. Now, with two locations in the heart of Sonoma County wine country, we can. Rack & Riddle has occupied its Alexander Valley location, dedicated to crushing and fermenting, since January 1st. The Healdsburg facility, located on Moore Lane a few blocks from the Healdsburg town square, focuses on all phases of sparkling winemaking, as well as still wine bottling and alternative wine packaging. Rack & Riddle will be making a full transition out of its original Hopland location – where it was based for seven years – over the next two months. The departure makes way for the Hopland building’s new occupant, Duckhorn Wine Co., which is unaffiliated with Rack & Riddle. The Sonoma County expansion poises Rack & Riddle as one of the largest custom crush facilities specializing in sparkling wine in California. Rack & Riddle anticipates significant growth through increased bottling, stainless steel tank and tirage storage capacity. As a result of the Alexander Valley expansion, 15 new jobs were created at Rack & Riddle; additional new jobs are expected to be created in coming months. In the past two years, Rack & Riddle has seen business soar by 40 percent. Production in 2011 grew from 700,000 cases a year to 850,000 cases the following year. In 2013, the company produced more than one million cases of wine on behalf of well over 100 winemaking clients. Based in Healdsburg, Calif., Rack & Riddle Custom Wine Services is proudly committed to providing pristine facilities where winemakers craft both still and sparkling wines. Rack & Riddle offers complete grape-to-bottle, base-to-bottle, and shiner programs for private labels, and houses 2 million gallons of stainless steel storage and fermentation vessels ranging from 500 to 50,000 gallons. An exceptional winemaking team produces over one million cases of wine annually. For more information, please visitwww.rackandriddle.com. SONOMA COUNTY, Calif., December 17, 2013—Rack & Riddle Custom Wine Services, one of the largest custom crushand winemakingcompanies on the North Coast, announced today it has signed a lease agreement for the Murphy Family Winery, located in Alexander Valley just south of Geyserville. Rack & Riddle will assume responsibility for all operations at the facility on January 1, 2014. The announcement follows months of negotiations between the Murphy Family and the two partners of Rack & Riddle—Rebecca Faust and Bruce Lundquist. The deal announced today adds significantly to the capabilities of Rack & Riddle in servicing clients particularly from both Sonoma and Mendocino counties. 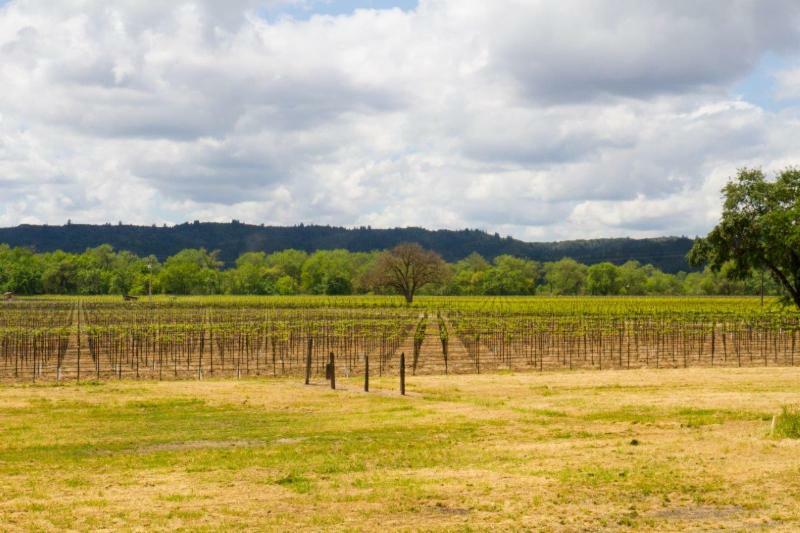 With the lease of the Murphy Winery containing 50,000 square feet of space, combined with the October lease of 67,000 feet of space in Healdsburg, Rack & Riddle has expanded its presence in Sonoma County in just two months to some 117,000 total square feet. To aid in the transition as Rack & Riddle expands to the facility, Murphy Family Winery owners Jim and T.J. Murphy will continue on at the location as consultants to Rack & Riddle. From a 120,000-square-foot facility in Hopland, a 67,000-square-foot facility in Healdsburg, and a 50,000 square-foot facility in Geyserville, Calif., Rack & Riddle Custom Wine Services is proudly committed to providing pristine facilities where winemakers craft both still and sparkling wines. Rack & Riddle offers complete grape to bottle or base to bottle wine production services, and houses nearly 2 million gallons of stainless steel tank storage and fermentation vessels ranging from 500 to 100,000 gallons. An exceptional winemaking team produces more than one million cases of still and sparkling wine each year. Rack & Riddle also offers a shiners program for those looking to add sparkling wine to their portfolio. Rack & Riddle is a California Certified Organic and Demeter Biodynamic® Certified winery. For more information, please visit www.rackandriddle.com. HOPLAND, Calif., October 22, 2013—Rack & Riddle Custom Wine Services, one of the largest custom crushand winemakingcompanies in the North Coast, and currently servicing more than 100 clients from its facility in Hopland, has announced it will be leasing 67,000 square feet of additional space in Sonoma County. The scope of the current Rack & Riddle operation in Hopland is significant. Currently, the company produces more than one million cases of sparkling and still wine each year on behalf of its clients. The expansion into Sonoma County will provide new and existing clients with additional custom services and importantly, geographic branding opportunities. “Many of our clients have been interested in being able to label their products as produced in Sonoma County. Obtaining a long-term lease in Healdsburg will facilitate our meeting those client requests,” said Faust. From a 120,000-square-foot facility in Hopland, and a 67,000-square-foot facility in Healdsburg, Calif., Rack & Riddle Custom Wine Services is proudly committed to providing pristine facilities where winemakers craft both still and sparkling wines. Rack & Riddle offers complete grape to bottle or base to bottle wine production services, and houses nearly 2 million gallons of stainless steel tank storage and fermentation vessels ranging from 500 to 100,000 gallons. An exceptional winemaking team produces more than one million cases of still and sparkling wine each year. Rack & Riddle also offers a shiners program for those looking to add sparkling wine to their portfolio. Rack & Riddle is a California Certified Organic and Demeter Biodynamic ® Certified winery. For more information, please visit www.rackandriddle.com. SONOMA COUNTY, Calif., October 14, 2013 – Rack & Riddle Custom Wine Services today announced it will host a celebration of the life and work of acclaimed winemaker Raphaël Brisbois on Saturday, October 26 at 3 p.m. at the Alexander Valley Hall in Geyserville. Friends and family are invited to attend. Brisbois passed away from cancer on August 22, 2013. Brisbois, a native of France, was a highly-regarded winemaker not only in Sonoma County, but across four continents. He was especially well known for 35-plus years’ expertise crafting premier sparkling wines. Brisbois brought passion, wit and joie de vivre to each project he touched. Through happy memories and great wines, his legacy will not be forgotten. For friends or family wishing to attend, please bring a special bottle of wine to share. Dinner will be served at 4 p.m. Attendance requires reservation by October 18 to Monica Smith at Rack & Riddle: 707-744-8100 or monica@rackandriddle.com. From a 120,000-square-foot facility in Hopland, Calif., Rack & Riddle Custom Wine Services is proudly committed to providing a pristine facility where winemakers craft both still and sparkling wines. 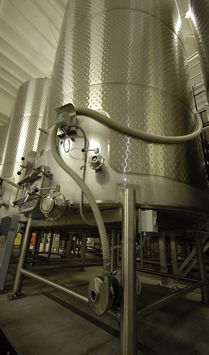 Rack & Riddle offers complete grape to bottle or base to bottle wine production services, and houses nearly 2 million gallons of stainless steel tank storage and fermentation vessels ranging from 500 to 100,000 gallons. An exceptional winemaking team produces more than 500,000 cases of still and sparkling wine each year. Rack & Riddle also offers a shiners program for those looking to add sparkling wine to their portfolio. Rack & Riddle is a California Certified Organic and Demeter Biodynamic ® Certified winery. For more information, please visit www.rackandriddle.com. Winners of the North Bay Business Journal’s ‘Women in Business’ awards were chosen from nearly 50 nominees. Factors included leadership in the organization, business-related innovations, vision and community involvement. Tell us about yourself and your company: I am very shy, but can get comfortable following an introduction. I run from spotlights, speeches and most meetings held for little or no purpose. I would much rather stick to a focused agenda each day that allows for accomplishment and progress. I love my children and take great pride in their success. Rack & Riddle has been a labor of love and seven-day work weeks. It has evolved from a simple beginning and a few clients to a very complex business with more than 150 clients. That is strategically challenging. We have an amazing group of employees and the effort they put in their jobs and the work they do on behalf of our clients leaves me humbled. We are lucky to have them all. I don’t know what the days ahead will bring, but the journey so far at Rack & Riddle has been filled with many twists and turns, a few surprises and tears and a great many moments of pride. I have been very lucky. What is a major accomplishment in the past year or so? : Launching a new sparkling wine brand, Breathless Wines, with my sisters, in memory of our mother. What is the achievement you are most proud of? : The establishment of Rack & Riddle, and finding my children still wanting me to be a big part of their lives. What is your biggest challenge today? : The need for capital to continue to expand the business. Getting a loan when you’re not wealthy, despite the success of Rack & Riddle, is difficult. Words that best describe you: Shy, fair and I have a big heart for anything involving my children, my sisters or any of their children. I very much love them all. As a successful female professional, what were the biggest obstacles you faced and how did you overcome them? : That my entrepreneurial spirit was somehow less important. I never stopped dreaming about having my own business though. Launching a wine business, especially one dealing in service that lacks the glamour of its own brand, and succeeding during a period a time when so many businesses failed was proof about dreams and daring to try. How do you think your profession will change in the next five years? : The need for more innovation in reaching consumers must be a major driver for those in the wine business. Spirits and beer are always trying to find a pitch to reach consumers. Wine as a beverage waits to be discovered. It’s the wrong approach. What advice would you give to a young woman entering your profession or the work world today? : Find passion, work hard, be fair in your judgement of others. Who was your most important mentor? : My mother, Martha Faust. She was in business before most women knew what business meant. She worked hard to raise three daughters and to make them believe they could succeed. She gave us all a strong work ethic and a determination to succeed. 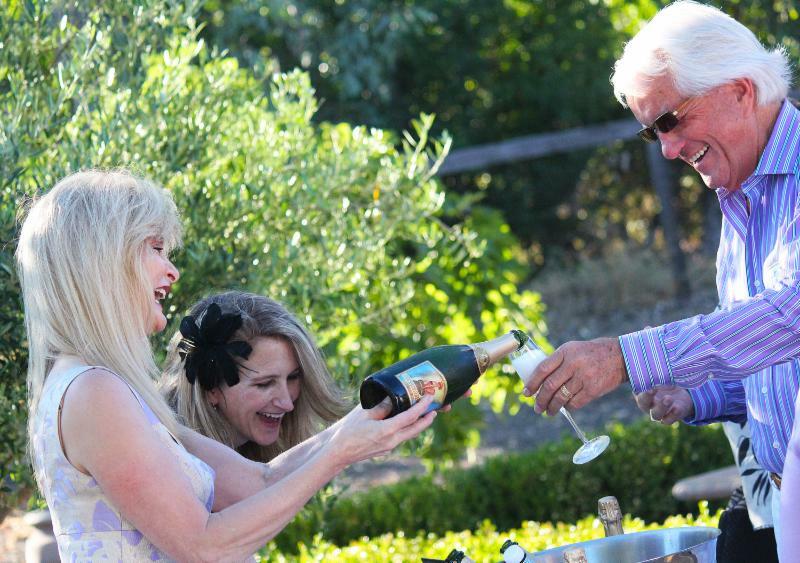 To learn more about Rack & Riddle's Custom Wine Services, please visit: http://www.rackandriddle.com/ or call 707-744-8100. Rack & Riddle is currently in the process of disgorging its current vintage of Methode Champenoise sparkling shiners. Our sparkling wine is a great opportunity for your tasting room, wine club or upcoming holiday events! Private labeling with your winery label and information is just a phone call away. For current production and pricing, contact Mark Garaventa VP of Business Development at mark@rackandriddle.com.
" As an Owner and a Winemaker, having a place to make your wine that you trust is a primary goal. Rack & Riddle has a professional and skilled team that has been in the wine business for many years. It is a team that I trust will do the job not only well, but also with respect to the individual needs of the client. I am a small 10 ton client. Rack & Riddle has a mix of large and small, equipment that is appropriate and the flexibility to work with a variety of clients. I always feel that my wine is just as important as the larger clients, which is exhibited by the updates I receive on a regular basis and the treatment I receive when talking with the team. This is such a great operation, that I joined the team! " 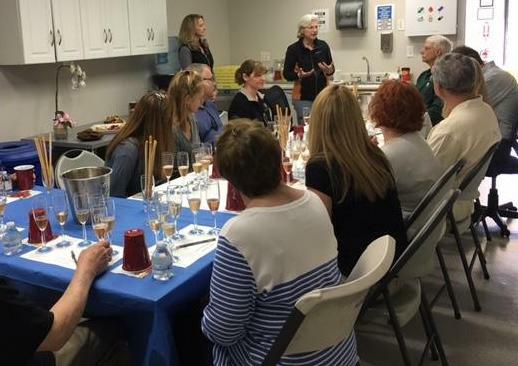 " "Sparkling wine has become an integral component of the entire tasting experience at Cast. Each guest is greeted with our bubbly Blanc de Noirs as we toast their arrival and set the stage for a warm hospitality experience. That would have been enough of a reason to offer this great wine, but the fact is that it is so good we just keep selling out every year. We couldn\'t do it without Rack & Riddle. Their entire team is so skilled, their service approach makes us feel like we are their only concern, and Penny Gadd-Coster\'s skill in the winery is unmatched. " " "Working with Rack & Riddle has been an absolute pleasure. 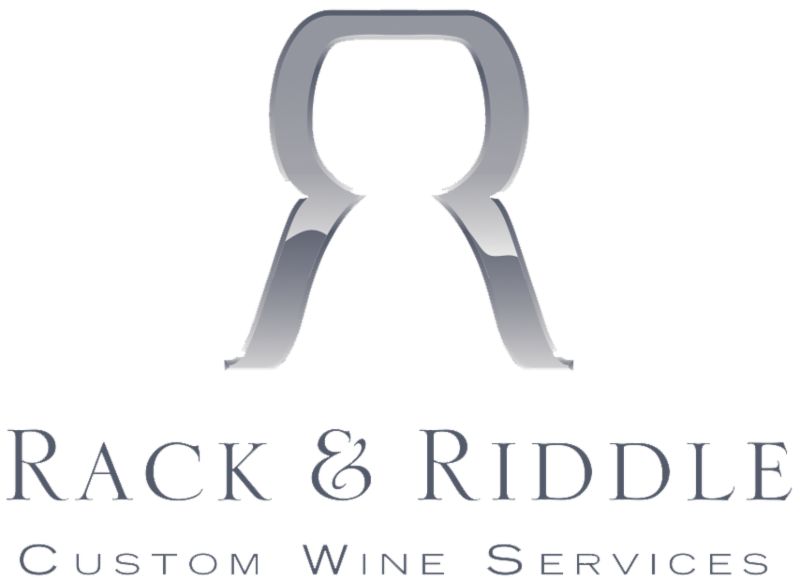 They are extremely knowledgeable and provide outstanding customer service, which affords us the opportunity to provide a superior product at a very reasonable price point.” "
Check out Rack & Riddle Custom Wine Services\' Complete List of Offerings! RACK &AMP; RIDDLE ON ABC! Rack & Riddle Custom Wine Services featured on ABC7! Call us at 707-433-8400, or email us. Or visit our website to submit a custom crush quote request form.